This little book by Dolitch, is the kind that give me tingles after I read it! You know, like when someone brushes your hair-those tingles! It is a lovely story! 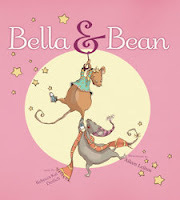 Bella writes poetry and Bean wants to play, she wants the attention of her friend, Bella. It begins like this: "Bella lived in an old brick house with white shutters, just up the hill from Spoon Pond. Every day she wrote poetry at a small desk, beneath a small window, shaded by a canopy the color of plums. " Bean likes to come to that exact window to talk to Bella and is bored with Bella's writing time. Click here to see Rebecca's website.